Last we week we posted a blog entry giving some new insights of the latest food waste statistics provided by FAO. Again we would like to highly recommend that you explore their new free database. Today we will present you a very important issue highly related to food waste, as well as to the malfunctioning of our global food system. 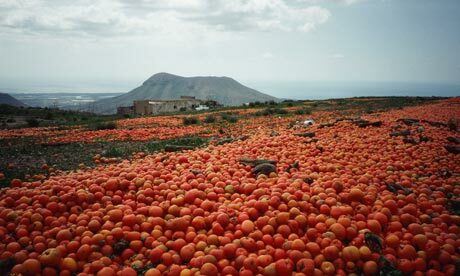 Postharvest waste is much of a bigger problem in developing countries. The already industrialized ones produce much more food than needed, so actually the postharvest waste is a necessity for them, as there is no market for so many produce. Food waste has many economical and environmental impacts. 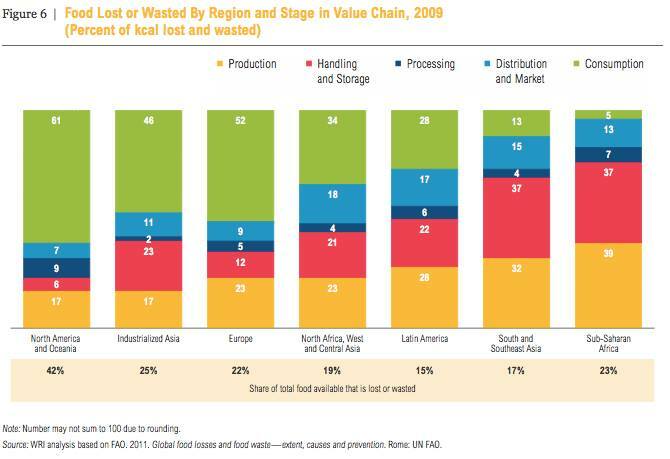 According to the WRI report on “Reducing food loss and waste” (these impacts) equate to a wasted investment that reduces the economic well being of actors in the food value chain. For example, food waste at the consumption stage costs an average of $1,600 per year for a family of four in the United States and £680 (about $1,000) per year for the average household in the United Kingdom. Annually, about $32 billion worth of food is thrown away in China. In Sub-Saharan Africa, where many farmers earn less than $2 a day, postharvest losses have a value of up to $4 billion per year. Even though there are many more people affected by hunger in Asia, Africa still seems to be a global symbol for hunger. How do you feel about the fact that in the Sub-Saharan Africa food aid worth of up to $4 billion dollar each year does not reach those who are hungry? The majority of the postharvest waste is due to the lack of the infrastructure, such as roads, efficient logistic strategies and many different technologies that help to store food. Especially in countries where climate is very warm, the storage possibility is very important, because together with humidity and high temperature fresh produce rot very fast. Before giving some solutions I would like to highlight another reason for the existence of this kind of waste. In fact many times market and law situation in developed countries affects farmers in Africa (or Asia) in such a way that they are unable to sell their crops. On the one hand, the way humanitarian aid works is not always effective. While the main goal of sending food to the hungry is accomplished, but the fact that is USAID buys crops from American farmers and then sends it to countries such as Ethiopia, the incoming crops debilitate the product of the local farmers. In other words, as the American farmers see their crops gets sold, Ethiopian farmers watch their crops rot in bags because they are too expensive to be bought as free food arrives from the USA. On the other hand, many laws prohibit some of the produce to enter given markets. For example in the EU, there are many laws stating the exact size, shape and color that a certain fruit or vegetable need to have in order to be able to enter the market. It makes it sometimes quite impossible for farmers all around the world to abide by these regulations. In order to reduce postharvest food waste, among others, farmers need to be aware of the existing technologies that could help them store food. One of the most important innovations in this field is the evaporative cooler. It extends shelf life of food and avoids spoilage by keeping the food at lower-than-room temperatures without having to use electricity. “When air passes over a wet surface, water from the surface evaporates into the air. As the water evaporates, it withdraws heat from the surface, creating a cooling effect upon that surface.” On the left you are able to see what are the advantages of using the Zero Energy Cool Chamber (ZECC) invented by Dr. SK Roy in the 1980s in India. Another solution is to avoid crop waste related to pests. Damage to crops coming from various insects can result in devaluation of the crop or even lead to its complete loss. Researchers at Perdue University in USA have invented a plastic storage bag to address this issue. The system uses three bags nested within each other. The inner one holds the crop in such a way that insects from outside cannot get into the crop. The bags are so well sealed that in a short amount of time oxygen gets depleted, so the insects die out. 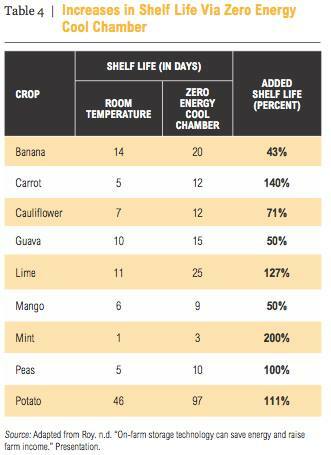 Researchers from Perdue University have stated that this system allows the crop to remain in storage for many months without degradation in quality due to pests. The third solution proposed in this blog is a construction of small metal silos. One silo can hold between 250-1000 kg of crops and it is a very effective strategy in postharvest waste reduction. Insufficient storage is the main reason of food waste for farmers, especially in developing countries. Not having the possibility of storing crops has also economic impacts. Selling all crops immediately after harvest means selling it at low prices. Because of the lack of storage infrastructure crops cannot be left for sale for a later time. An advantage of a silo is its relatively low price of construction. Prices for a silo of a capacity of 500 kg vary depending on the country between $ 30-97. In this entry we wanted to open your eyes to a specific food waste issue that exists mainly in developing countries. Even though, postharvest waste exists mostly in developing countries it is definitely an issue that has to be tackled all over the world. The Zero Energy Cool Chamber (ZECC) was invented by Dr. SK Roy in the 1980s in India. The zeer pot was invented by a Nigerian teacher Mohammed Bah Abba. Thank you for your comment. We have already change the information in our text. No problem Michelle:) I hope your meal was or will be delicious! If you guys would like to discuss more this topic feel free to share with us your ideas. Take care and thank you for the kind words! I savour, cause I found exactly what I used to be taking a look for.